At The Vault we include complimentary aromatherapy in every massage! We believe in the healing properties of essential oils, and we know how much they can enhance a body re|treat|ment. Our talented massage therapists will select the perfect essential oil to enhance your individual experience. Topical use of oils is very beneficial, as we can apply them to pulse points so that they may absorb into our bodies and even use them to relieve muscle tension! Essential oils can help promote emotional, physical and spiritual healing. They have been shown to destroy harmful bacteria and viruses, while simultaneously providing immune system support. We use three main blends of doTerra essential oils here at The Vault. Balance, Breathe, and Citrus Bliss. They each have their own distinct scents as well as different benefits! The Balance essential oil blend is made up of spruce, ho wood, frankincense, blue tansy, and blue chamomile giving it a warm, woody aroma. This essential oil is excellent for promoting tranquility and relaxation, as well as giving you a sense of calm & well-being. This essential oil is best for stress, anxiety, jet lag, mood swings or stress, anger, and even grief. The Breathe essential oil blend is made up of laurel, peppermint, eucalyptus, melaleuca, lemon, Ravensara, and cardamom. Breathe maintains feelings of clear airways and easy breathing while minimizing the effects of seasonal threats. It is best used for allergies, cough or congestion, sinusitis, and restful sleep. If your seasonal allergies are acting up during this transition into fall then this might be the best oil for your next massage! The Citrus Bliss essential oil blend is made up of lavandin, lavender, sandalwood, tangerine, mandarin, bergamot, clementine, and a hint of vanilla. This unique, harmonious blend is a fresh, sweet smell that will boost your mood! This blend is amazing for re-energizing and refreshing, elevating your mood and mind, stimulating, uplifting, and easing stress and anxiety. 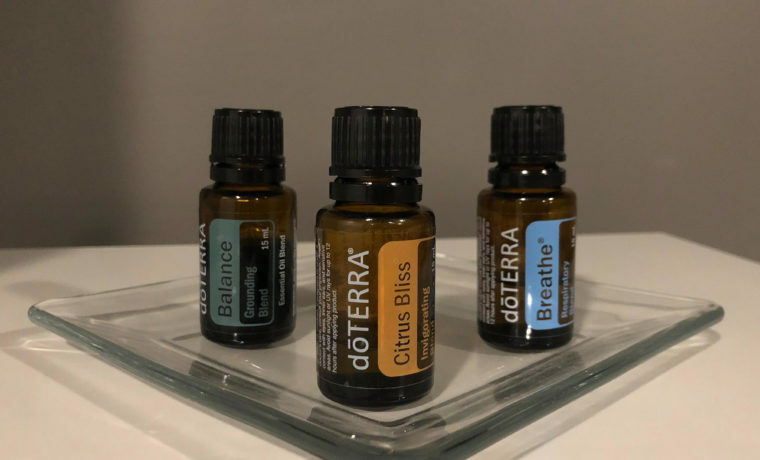 Our massage therapists can assist you in finding the perfect essential oil for your aromatherapy, or you can just trust your nose and pick the one that speaks to your senses!